"Deo Fidem Habemus Ceteris Invigilamus"
The Director UF Starfleet Intelligence falls under the authority of the Chief of UF Starfleet Operations. The Intelligence branch serves to be a pinnacle of information gathering, and is there to assist Chapters and Members with gathering information from around the Known and Unknown Universe. Intel is unique in the fact that it works closely with other departments, analyzing and collating information and passing it up the chain of command. This division is responsible for collecting information on the species, races, and situations that may have an effect on UFS. These agents utilize many different tools and methods for data collection, from scanning information from sensors to covert 'on the ground' observation and interviews with beings that have information that may be useful to protecting UFS' interests. Collect, Analyze, and Disseminate information of tactical and strategic value by any means permissible under the United Federation Starfleet Charter, United Federation of Planets policies and procedures which does not violate basic inalienable rights. Brief commanding officers regarding all threats and advise mission planners as to current threat conditions which may adversely affect the success of a mission. Maintain excellent two-way communications with UFS Commanders, personnel, and or other parties cleared by the UFS Commander in Chief, and focusing intelligence efforts to support their tactical and strategic mission requirements. Maintain the strictest levels of information security and operations security policies and enforcing practices in keeping classified and/or confidential information from unauthorized disclosure. For exploration and defense, the Federation relies on Starfleet. For pure research, it calls upon the Science Council. For information on other species, their worlds, governments, equipment, and influences in the galaxy, as well as the protection of such information pertaining to the Federation and its allies, the Federation turns to Intelligence. In the Delta Quadrant, this relationship between United Federation Starfleet and United Federation Starfleet Intelligence (UFSI) is no different. 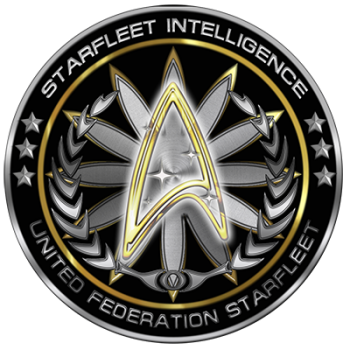 UFSI is a branch of the United Federation Starfleet and was founded shortly after the formation of the UFS itself. Their charter was to uphold and defend the UFS Constitution, and investigate any potential threats to the laws or the security of the Federation, as well as build and maintain operational files on griefers, and share this information with other sims. They quickly found themselves with a great deal to do, as UFS began to draw the attention of the surrounding civilizations, and it went through its early years of settling into a new government and way of doing things. UFSI handled a number of early "growing pains" which ultimitely led to the re-organization as a division subordinate to the Security Branch. There were also matters involving smugglers, pirates, and other criminals seeking to prey on Federation shipping lanes, along with the invention of new forms of crime as new technologies and ways of thinking became available. Intelligence agents tracked down and brought these criminals to justice according to Federation law and the applicable local laws of the worlds from which they resided, making it clear that the Federation's open society was not an invitation for criminal activities. Over time, new ways of incorporating Intelligence Officers into starship and space station crews led to the Intelligence Division's emergence from the Security Branch and subsequent elevation of UFSI as a full branch of UFS, with divisions dedicated to mission enhancement by maintaining continuity of information on enemies throughout the galaxy, but more specifically those in the star systems nearest to Pinastri and Excalibur. UFSI became additionally responsible for counterintelligence operations within the UFS, dealing with spies and saboteurs from different civilizations, and even dissidents formerly members of the Federation, seeking to weaken the alliances between UFS and the other races. UFSI underwent a major restructure in 2384 (UFS Stardate 090206) and again on Stardate 091015 leading to yet another restructure on Stardate 091102. The current state of the Branch includes all members recalled to Headquarters indefinitely, however plans are in the works to redeploy officers back to stations and startships while maintaining a robust headquarters to support the deployed officers and crews. Despite these major mission changes, intelligence remains one of the smallest branches in UFS, and yet it is the one most feared by the rest of UFS mostly due to prior mismanagement. Its powers come directly from the UFS adaptation of the Federation charter; Article 14, Section 31 and within Starfleet Regulations; Special Order 66715. The overseeing body is the Joint Chiefs. This page was last edited on 7 July 2017, at 00:28.